The synovial cavity (Fig. 3.6) is the space found between bone segments and articular capsule; it is delimited by a fibrous wrap internally covered by a synovial membrane and contains a slight film of synovial fluid. The synovial cavity consists, depending on where it is found, of the joint cavity, the bursae and the tendon sheaths . The synovial fluid has a variable volume according to the dimension of the articular cavity and it represents, physiologically, a thin veil to protect the cartilage surface; it acts as a lubricant and it has nourishing functions for the cartilage itself. The synovial fluid is filtered from the blood plasma and it contains a maximum of 200 cell/cc. It also contains electrolytes, glucose, enzymes, immunoglobulins and proteins mainly originating from blood, with the addition of mucin - mostly hyaluronic acid - which is well-represented. The mucin makes the synovial fluid viscous, elastic and plastic [12,13]. 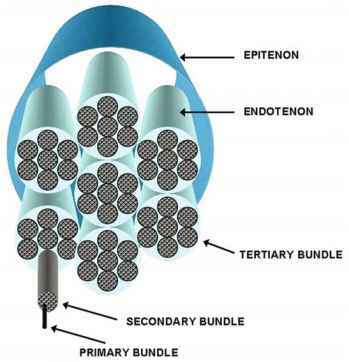 The articular capsule consists of intertwisted bundles of connective fibrous tissue, whose insertion onto bone occurs as a continuous line. At some points the capsule is strengthened by the intrinsic capsular ligaments, represented by local thickenings (made of fibrous or fibro-elastic tissue) of the capsule itself, where the fiber bundles become parallel. The articular capsule is internally covered by the synovial membrane. The synovial membrane is a connective tissue of mes-enchymal origin, covering any exposed osseous surface, the synovial bursae in communication with the joint cavity and the intracapsular ligament and tendons; it is not present on meniscal and discal surfaces and it stops right before the edge of joint cartilage, the peripheral area of which, only a few millimeters thick, constitutes a zone of transition from synovial membrane to cartilage . In the synovial cavities of some joints, adipose tissue is stored in specific regions, forming mobile and elastic pads that fill in the spaces of the articular cavity. Such adipose stores, when the joint moves, adapt to the changes of shape and volume of the synovial cavity, supporting the lubrication of the joint surfaces. The synovial membrane is made of a cellular intima lying on a fibrovascular subintimal lamina consisting of abundant loose areolar tissue, collagen and elastic fibers. When the synovial membrane covers the intracapsular tendons or ligaments, the subintima is hardly identifiable as a separate layer, being fused together with the capsule, the ligament or the adjacent tendon [12,14]. The synovial intima is made of cells, called synoviocytes A and B, whose function is to remove the debris found in the joint cavity and to synthesize some molecules for the synovial fluid. The synoviocytes do not actively proliferate under basal conditions, while the speed of cellular division is considerably increased after trauma and acute hemarthrosis . The bursae are virtual spaces localized in specific regions of the joint where high friction between closely opposing structures occurs. The bursae can be visualized almost solely in pathologic conditions, because they physiologically contain a slight film of synovial fluid. As above, the bursae are covered by the synovial membrane that continues from the synovial membrane of the articular cavity, so that it constitutes communicating bursae where the synovial fluid is freely circulating. The communicating bursae have a further biomechanical function: they decrease the endoarticular pressure when there is a fluid collection in the joint cavity. graphic size of the synovial cavity and age, gender, height or body weight; the maximum difference between one side and the contralateral side is about 1 mm. posterior diameter does not measure more than 3-4 millimeters. Dynamic assessment, performed during contraction of the quadriceps femoris muscle, shows a slight increase both in the antero-posterior diameter and in the recess length. The increase in fluid collection during this phase, related to the mean sagittal diameter increase of the bursa (1 mm), can be related to the simultaneous contraction of the suprapatellar recess tensor muscle. This small muscle drags the bursa, causing a vacuum effect that causes the bursa to fill with fluid coming from the joint cavity . In people who are fit, compared to those who lead a sedentary life, the suprapatellar recess diameter does not change, but it is well-visualized in 25% and in 66% of patients, respectively, according to the relaxation and the contraction of the quadriceps femoris . The synovial membrane contour can be indirectly assessed when the suprapatellar recess is distended by synovial fluid. It appears as a thin echoic band of 1.7 mm (mean value) . The anterior synovial layer of the suprapatellar recess is usually more easily identified than the deep layer. The first can be easily assessed thanks to the different echogenicity of the overlying quadriceps tendon, which appears moderately echoic, while the latter is strictly contiguous with the pre-femoral fat pad,which is echoic and has a maximum thickness of about 1 cm. Normally the synovial fluid in the subquadricipital recess is homogeneously hypoanechoic and any change is related to pathology (Fig. 3.7). The articular capsule, is extremely thin and can be barely identified by ultrasound in physiological situations, whereas acute, inflammatory, or post-traumatic pathology makes it easily visible because of the natural acoustic window provided by the joint fluid collection. In order to identify the capsule, it is necessary to have precise anatomical reference points, joint by joint. The articular capsule appears as a thin hypere-choic layer, hard to differentiate from the adjacent tendons and ligaments that have very similar echogenicity . In the shoulder, the superior edge of the capsule corresponds to the inferior echoic edge of the tendons of the rotator cuff muscles (supraspina-tus, infraspinatus and teres minor); it is only when pathology occurs, such as an adhesive capsulitis -causing thickening and retraction - that the capsule can be identified as a marked irregularity of the inferior profile of the rotator cuff tendons. The axillary recess of the inferior edge of the capsule is more easily explored. 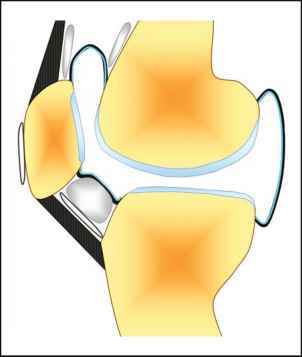 The articular capsule of the knee can be easily assessed in the internal and external compartments, where the collateral ligaments delineate the capsule borders. The same procedure can be applied to assess any other joint of the hand and foot [16,17]. What is the role of synovial cavity in bursea? Can a synivial cavity repair? What is synovial cavity in hip joint? What is the function of the synovial fluid? WHAT ARE THE FUNCTIONS OF THE YNOVIAL CAVITY? Where are synovial cavities located? What is the synovial cavity of the elbow?